Leaders of all the faith communities represented at the annual Unity Service conclude the evening by singing God Bless America. CORAL SPRINGS | Interfaith clergy, along with nearly 600 people from the Parkland-Coral Springs area, came together Nov. 20 for a beautiful night of prayer and song: the annual pre-Thanksgiving Interfaith Unity Service. Msgr. Souckar is a member of the Clergy Coalition of Coral Springs and Parkland, which organizes the event each year along with the Coral Springs Multi-Cultural Advisory Committee. The gathering is held at one of four different places of worship that is large enough to accommodate everyone. This year it was held at Temple Beth Orr in Coral Springs. “I very much enjoy being part of the Clergy Coalition,” Msgr. Souckar said. “Our monthly gatherings are an opportunity to get to know one another well and to foster mutual understanding and collaboration. 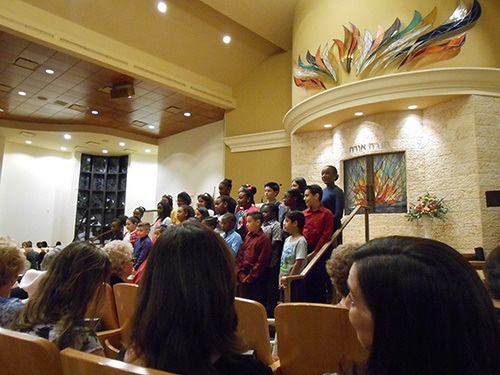 The children's choir from St. Andrew Catholic Church, directed by Mary Lou Taff, perform "Para Amar Como Tu" (To Love Like You), at the 2018 Interfaith Unity Service which took place a couple of days before Thanksgiving in Coral Springs. The reflection this year by Msgr. Souckar touched on the tragic events at Parkland this past February, the shooting at the Tree of Life Synagogue and the California fires. The evening featured the combined choir, a children’s choir and a presentation by Parkland Mayor Christine Hunschofsky and Coral Springs Mayor Pro Tempore Lou Cimaglia. The night ended with everyone singing Let There Be Peace on Earth, God Bless America, and America the Beautiful. Other places of worship that took part in the evening included: Baha’i Assembly of Coral Springs, New Dawn Community Church, First Church Coral Springs, Christ Church-A Lutheran Ministry, Royal Palm Christian Church, and St. Mary Magdalene Episcopal Church. Participants also were invited to donate to the poor and provide canned goods for food pantries in the community. “As a Christian theologian, I recognize the blessing that is released in a community when it recognizes God by thanking him. It is an act of humility that releases grace,” said Rev. Randall Cutter, pastor of New Dawn Community Church, who co-chairs the Clergy Coalition. Reporter Gigi Fontanilla and photographer Ashley Witherow are members of St. Andrew Parish, Coral Springs.